South Tahoe's Luke Allen speeds down a slalom course Wednesday at Heavenly to take home first place. SOUTH LAKE TAHOE, Calif. — South Tahoe’s Luke Allen made a blazing fast debut Wednesday in the Tahoe Basin Ski League. Allen weaved his way through the slalom gates on the World Cup run at Heavenly Mountain Resort and just edged out his good friend, and Whittell senior, Gunnar Barnwell by one-tenth of a second to take first place. Allen’s finish helped the Viking boys finish second place as a team to match the Lady Vikings second-place result. 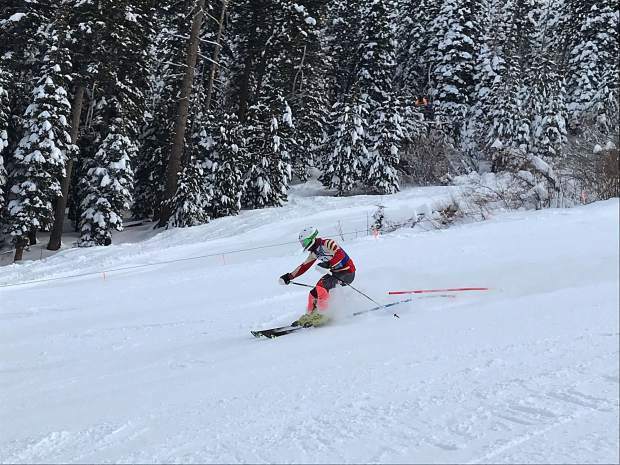 Allen and Barnwell have competed this year mostly in International Ski Federation and Far West Skiing events all over the western United States as members of the Diamond Peak Ski Team and haven’t been able to participate in high school meets due to conflicting schedules. The course was soft due to the big snow dump over the weekend and into the early part of the week. The course was quickly rutted and holes developed that tripped up some faster skiers and slowed times. Allen and Barnwell were separated by two-hundredths of a second (21.55 seconds to 21.57) after the first run and both were nearly a second ahead of the other 31 finishers that completed both runs. Allen padded his lead on his second run and finished with a combined total time of 46.09. The top four finishers were separated by .62 seconds. Lyle finished 10th, Sullivan was 12th, Cameron Grant was 14th, Aaron Johnson was 16th and Ralston Johnson was 17th. Barnwell led the Warrior boys to fourth place as a team. Also for Whittell, Justin Smith was 18th, Patrick Smorra was 22nd and Sam Rusk was 27th. Incline’s Otto Albrecht was one of two Highlanders on the slopes and was the only one to complete both runs. He finished ninth and the team was sixth. Summer Furrer was sixth-fastest on each run and finished in sixth place with a combined time of 58.29. The Lady Vikings also had Annie Ferguson finish 12th, Ella Bicker in 15th, Elizabeth Nakamoto in 16th, Jamie Johnson in 17th and Kiara Furrer in 19th. Whittell’s Abrielle Goehring was 20th and Lila Humlick was 28th. The next league race is schedule for Tuesday, Feb.12, at Alpine Meadows.